Now here is an unusual image of Phobos, Mars' moon. 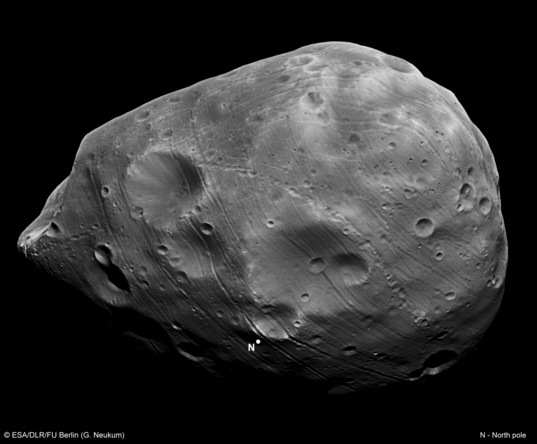 We are looking onto the side of Phobos that faces away from Mars. 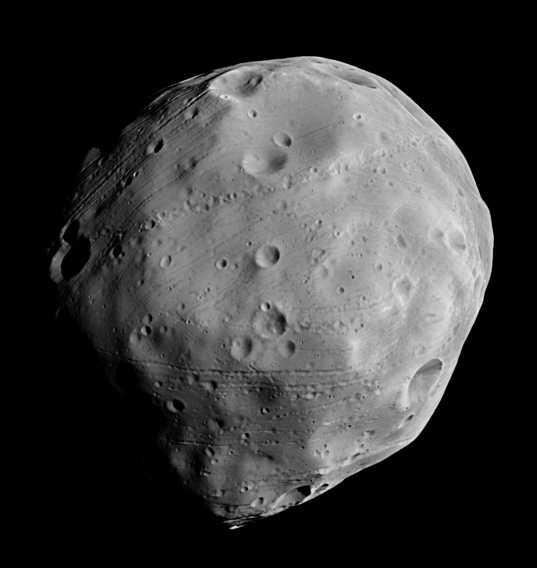 ESA's Mars Express is the only spacecraft currently in Mars orbit -- the only one since the Viking orbiters -- that is capable of imaging the far side of Phobos. Mars Reconnaissance Orbiter and Mars Odyssey and before them Mars Global Surveyor only ever got to see the other side of the moon, the one that faces Mars (and includes the huge crater Stickney). Mars Express has taken good advantage of its season of close Phobos encounters to produce this high-resolution view. This photo was released as part of a red-blue 3D anaglyph of Phobos; it is the red channel from that image. It has been rotated so that north is approximately up. Taken by Mars Express on March 10, 2010, from a distance of only 278 kilometers and has a resolution of 9 meters per pixel. It shows the face of Phobos not visible from any other spacecraft currently in Mars orbit -- the side that faces away from Mars. All other Mars orbiters travel so close to the planet that they only ever see the Mars-facing hemisphere of the moon. They released another view of Phobos today, also from an unusual perspective (though one that Mars Express has imaged before), down onto the north pole. It's getting toward summer in Mars' northern hemisphere, so the pole is well lit just now. Mars Express captured this view down onto Phobos' north pole on March 10, 2010, during a series of close encounters with Mars' moon. The crater Stickney is the bite out of the moon at left; Mars is to the left, out of frame. Phobos' leading hemisphere is up.